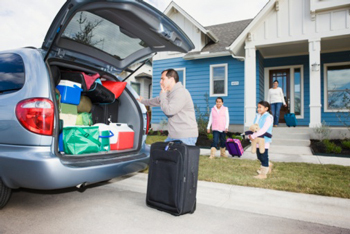 Before you pack up and head out, make sure you aren’t neglecting security of the home that you’re leaving behind. While the preliminary 2013 Uniform Crime Report published by the FBI reports that robbery, burglary and property crime are in decline, it’s still important to take appropriate home safety precautions. Here are a few tips that can help protect your home while you are away. Keep your traveling under wraps. While you may want to share your exciting travel plans, it’s best to keep that news offline. Posting information about the date and destination of your trip on social networking sites like Facebook or Twitter makes you an easy target for potential burglars. It’s also important to be conscious of your social media activity while you’re gone. Avoid sharing your whereabouts via various location-based social networking websites such as Foursquare. As tempting as it is to share a picture with friends, wait to post photos from your trip until you return home. If you have already shared it on every social media platform and have told everyone you know about your holiday plans, it may be a good idea to get a form of protection like home contents insurance put in place, as you never know what could happen when you are away. It is better to be safe than sorry. Discourage burglars from choosing your home. Burglars prefer to break into homes that are unoccupied, so one way to protect your belongings is to make it appear as though you are home. Set timers on lights, radios and televisions to turn them on during appropriate times. Ask a neighbor you trust to put your trash cans out on trash day and pick up your mail and newspaper. You can also temporarily stop delivery of your mail and newspaper while you are away. Additionally, burglars will take notice of an overgrown lawn and use overgrown hedges as a hiding spot. Make proper arrangements to have your lawn mowed and foliage trimmed if you will be gone for an extended amount of time. Deny easy access to your belongings. Research shows that burglars usually spend no more than 60 seconds breaking into a home. Using locks on windows and doors is one of the most basic ways to increase the break-in time, which may cause burglars to look elsewhere. It is estimated that nearly one-third of all burglars enter through the front door, so install deadbolt locks for added security. Also consider using motion-sensor lights in the dark areas outside of your home, such as your garage or backyard. Manage the risk by enlisting help. Inform trusted neighbors, friends and family of your vacation plans and ask them to keep an eye on your property. Tell them how long you will be gone, as well as names and descriptions of anyone who may need access to your house. Always leave a house key and a phone number where you can be reached with a trusted individual. Avoid accidentally triggering your alarm by making sure anyone who will have access to your home knows how to properly operate your alarm system. If you will be taking an extended vacation, consider a house sitter and let your local police know when you will be away. Protect your home by being able to detect a burglar. A recent study that interviewed more than 400 convicted burglars revealed that around 60 percent of subjects admitted that the presence of an alarm would cause them to discontinue the crime. Research also show that homes without security systems are three times more likely to be broken into than homes equipped with a system. By investing in a security system, you’ll add to your protection and peace of mind, whether you’re at home or away. You can find a reputable security company that is a member of the Electronic Security Association (ESA) in your area here. Before your vacation, get into the habit of arming your system each time you leave your home. Crime statistics show that homes with security systems are often successfully burglarized because the system was not armed at the time of the burglary. Keep an eye on your home while you’re away. Smart home technology can be a useful tool for protecting your property while you travel. An enhanced security system complete with surveillance cameras gives you the power to see what’s going on in your home and receive activity alerts straight to your web-enabled device. Smart home technology can also save you money on your heating bills while you’re away without having to come home to a chilly house. With the press of a button, you can program your lights and air conditioning to turn on before you get home. Don’t leave your home vulnerable to a burglary. Click here or call (888) 447-1689 to find an ESA member that can create a security plan that will protect your home during your vacation and beyond.